I sure as hell cannot turn down a great deal and when it's on nail polish, I am especially weak. This week I picked a few things up at my local Sally Beauty and CVS. Here's a look at what I picked up. Sorry I have no nail pictures, skittles will happen soon. 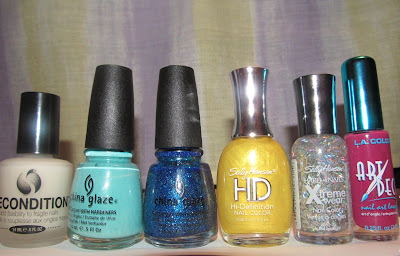 from left to right: Seche Recondition, China Glaze in For Audrey, China Glaze in Dorothy Who? , Sally Hansen HD in Lite, Sally Hansen Xtreme Wear in In the Spotlight and finally Art Deco in Intense Pink. I picked up the China Glaze at Sally Beauty where they had a sale where buying two China Glaze polishes got you a Seche Nail treatment for free. For Audrey is a light blue-green with no sparkle or shimmer and Dorothy who is her exact opposite being bright blue and full of glitter. The Seche Recondition treatment adds flexibility to fragile nails. Both of the Sally Hansens I picked up at CVS for about three dollars for both. I needed more glitter desperately and the rainbow reflections of In the Spotlight hypnotized me. They are much more intense than those in the picture. The yellow was the only sale polish in the HD line of polishes which I've wanted to try for a while now so I picked this one up as it was so inexpensive. Finally the Art Deco. It was a dollar. So obviously I bought it. I'm not sure how I feel about the brush. It's super long.... Has anyone done or saw something incredible with an Art Deco polish? Let me know in the comments. The kinda awkward Art Deco brush.